It has been quite a week for the Minister of Education, Martin Dixon and his director of school Ministry, Evonne Paddison. Both Martin and Evonne got to end their busy week with a rather intrusive visit from a TV crew … you know the kind with the bright lights and the pesky reporter. Then they got to watch themselves get abraded by one of the nations top human rights lawyers, Andrea Tsalamandris, who is representing parents in the FIRIS campaign. We will post the video of of Plaintiff Sophie and Liz (who is understandably frightened of being public and appeared only in shadow on the TV). As an aside, Mr. Dixon, if at any time you would like these beatings to cease, you are free to take out your pen and remove the conditions which have your citizens feeling like they should mask their identities and use the courts to communicate with you. You have the power in your hand to remove the oppressive conditions under which ACCESS Ministry thinks it is wise to operate in our schools. 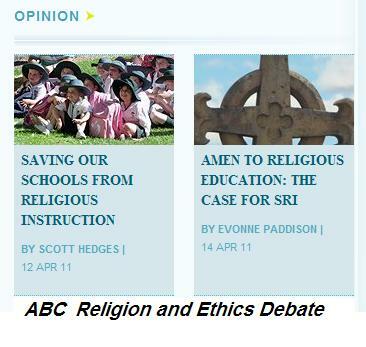 A less sensational event was the ABC Religion and Ethics debate hosted by Scott Stephens (an Anglican priest). Stephens put up two stories, one by a FIRIS parent, one by the CEO of ACCESS Ministry, a $12M outfit that currently has the full backing of Martin Dixon. We say currently, because Martin Dixon is no fool … and the arguments speak for themselves … as Barney Zwartz presciently noted, the advocates of the current system are “doomed”. You are wilfully missing the point here. You argue that the law clearly states that schools MUST allow religious people in to give lessons to the children, as if you think your opponents are guilty of bad legal interpretation. No, the law is not divine scripture (and neither is divine scripture for that matter). SRI is bad, wrong and unfair regardless of what the law may say. You further miss the point in saying the Act allows reps from ANY recognised religion to demand access to school children–as if your opponents are arguing that this is an EEO issue, as if your opponents are worried that rival religious enthusiasts are missing out! I don’t want the pushers of any superstition to be given automatic access to school children. Non-believers in any particular superstition should not have to ‘excuse’ their children. Can you not see what an arrogant choice of verb that is? Parents may ‘invite’ religous people to talk to their kids. They may even ‘accede’ to a request, but they don’t (shouldn’t)have to ‘excuse’ their children to any religious proselytizer. I pulled my kids out this year after 2 years for my youngest and 3 for my oldest. My husband and I are not religious but we are aware that an understanding of religion, Christianity in particular, is important in understanding our history, laws, art, holidays and literature so we chose to allow our children to attend RE classes at our local state Primary school. After careful evaluation of the texts and syllabus and the way in which the Access Ministries Christian volunteers imparted the information we came to the conclusion that the lessons were doing nothing more than attempting to indoctrinate the children into the Christian faith. Claims of “truth” without evidence or ability to question were rampant. This is not the way to teach children about the world. Religion should be taught in state schools by QUALIFIED teachers and ALL religions should be taught in an unbiased way. THIS IS NOT HAPPENING. It needs to stop. When they teach about the many facets of all religions in an informative manner in schools then it may be education provided that students are allowed draw their own comparisons and come to some independent conclusions about their faith or lack thereof. Until then its more than likely to be just good old fashion indoctrination of a kind that many parents send their children to state schools to avoid. We are a broad coalition of parents whose children are currently in this system and we don’t have “theoretical arguments”. We are not suing over “ideas” but the experiences we are having. What is going on is wrong. The sooner Mr. Dixon gets this message the sooner he can think about his responsibility to the people of Victoria and distance himself from ACCESS Ministry, which is using the schools as a source of mission and ministry. We understand that there are a lot of good people who mean well and volunteer their time, because they are called to perform ministry and spread the gospel etc … We simply will not let them do this with the full executive support of the Department of Education. This is a free country and everyone is free to practice their religion and evangelize for their cause, but they can’t have the rule making authority of the Minister of Education in support of that agenda. That is what is happening here, and our aims are clear.